The Horror Digest: Pacific Heights: Actually No I DON'T Want Your Creepy Doll House Michael Keaton! Pacific Heights: Actually No I DON'T Want Your Creepy Doll House Michael Keaton! What is it with the 90s and the irrational fear of creepy roommates and/or tenants? How hard is it to do some actual fact checking? And why didn't that first guy just put his credit check application in the MAILBOX?! Unbeknowst to many of you, Pacific Heights has been the most sought after movie on Netflix for at least 5 months. I've been watching it for months on my queue and it never switched from "EXTREMLY LONG WAIT" to "Now Available". Was this movie really that popular? Or was some creepy Michael Keaton fan just hoarding them all? You decide. Well as luck would have it a few days ago it's status did change and I promptly moved it to the top before it became an extremely long wait again- because you better believe it- it WAS an extremely long wait. 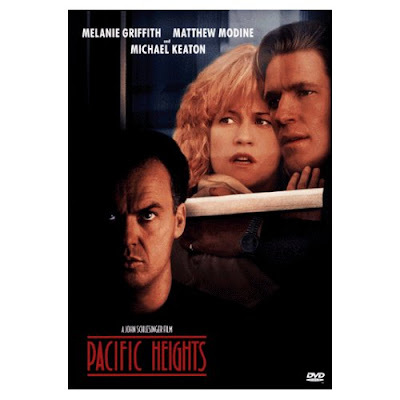 As it turns out, Pacific Heights features Michael Keaton at his creepiest and it's not the best movie so I'm guessing that a crazed Michael Keaton fan really was hoarding all the copies. So here's the deal; Melanie Griffith and her boyfriend Drake decide to buy a fixer upper and rent out the apartments. Fun project I guess- until one of there tenants a certain Michael Keaton locks himself inside the first floor apartment before paying his rent. He changes the locks, lets cockroaches run amok, and does construction at odd hours of the night. When Drake tries to do anything about it, Michael Keaton is always one step ahead- and it soon becomes very clear that this sinister man has an agenda and he's not afraid to use it. Plus he's a psycho and somehow retains ownership of the house by craziness. It's just crazy man. The movie is pretty frustrating because it's one of those....everything possible goes wrong movies and sometime those can really stress me out. Michael Keaton is with no question one of the creepiest men alive- and putting him in a role that demands this creepiness is just cruel. Honestly who decided to cast him as Batman? Too creepy! There are moments in this movie that just make you cringe because that's how vile and creepy he really is! I know I'm using the word creepy a lot, but it's all I can muster when I look into his eyes. The best part hands down is when Melanie Griffiths exacts her revenge. She really hit all the spots there! Although I question her decision of at first giving the maid all that money and then taking back most of it except a few hundred...what a biotch. And then there is of course the final confrontation with Michael Keaton- holy jeesh! But the part that I found to be really really unsettling was when Melanie goes down into the basement to get the power back on- and Michael Keaton's just sitting in his car smoking and looking at her...!? And then there is his fantastic notion that building someone a doll house is the best way to make up for past deeds. Yeah because everyone over the age of 30 wants their very own doll house. Ugh. Overall some pretty decent moments of fright, but mostly a "thriller" with a slow build up. I'm glad I waited 6 months to see this! Not. It's not a bad movie- I just don't get why it was always unavailable! Load of crap if you ask me. This movie actually made me angry, so I guess it did its job in that respect, but I don't want to see it again because it was no fun.